It is estimated that 34% of young women in America get pregnant at least once before age 20. There are 750,000 teen pregnancies each year with 59% ending in birth. An estimated 82% of teen pregnancies are unplanned. (Guttmacher Institute 2011). Mercy Multiplied is committed to providing solutions for young women facing an unplanned pregnancy. In addition to receiving weekly counseling sessions and group counseling through Mercy’s residential program, pregnant residents complete a six-week Basic Decision Making course. This additional class includes biblical counsel and practical information on the options for both parenting and adoption. Mercy is dedicated to providing resources to help each young woman make a decision that brings her peace. We recently had the opportunity to catch up with “Mercy baby” Alexis, whose mother, Sara, faced an unplanned pregnancy 19 years ago and sought Mercy for help. Sara went through Basic Decision Making and chose to parent Alexis. Sara later went on to work for Mercy’s Intake Team for a time, helping other young women facing difficult life situations apply to Mercy’s program. 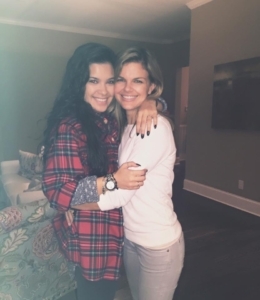 Read the Q&A below to see how Mercy’s program positively impacted both mom and daughter. Can you give a brief overview, from your perspective, of what brought your mom to Mercy? My mom got pregnant at 16 and came from a good, two-parent home. But, even coming from a good home, she was still in an awkward situation when she got pregnant. Mercy for her was a place where she could get out of her normal environment and hear God in order to understand where her life was headed with such a major life change. Your mom was a single, teenage mother. How do you think her time at Mercy impacted that role for both of you? My mom grew a lot during her time at Mercy. She grew in her relationship with God and in her self-confidence. That totally played a big role in her raising me. We always went to church and talked about God. That set me up very well to have my own relationship with God. How have you seen the tools your mom learned at Mercy play out in your childhood, teen years, and now, moving forward? My mom was very patient with me growing up. As I got older, I think her time working at Mercy helped her a lot because she had been around girls my age and knew their stories. How do you see God in your mom? Is there anything you’d like to brag on her about? Where do I even begin? My mother is the absolute best woman I could have asked for to raise me. She has always been there for me when I needed to talk to someone or get advice. We balance each other out and are very close. I always know she has my back, and that is really comforting. What do your next steps look like? What are your hopes and dreams for your future even beyond the next few years? I’m planning to go to Columbia State for two years and then go to a four-year college and possibly get into the insurance world. I hope to graduate college with a good job. I also hope to do some mission work and travel to new places around the world. How do you see yourself as the “Me” in Mercy? To me, the “me” in Mercy means that I’m part of Mercy’s legacy. I’m one of Nancy Alcorn’s “adopted grandbabies.” Mercy made my life possible because it gave my mom an opportunity to grow closer to God and clearly think through her parenting options. I’m so happy my mom had a place to go to be able to grow and learn the tools she needed to give me good future. How has your mom’s journey and faith shaped your personal relationship with the Lord? It has made my relationship with God a lot stronger because she has shown me that God can turn anything bad into something good. Mercy has shown me that everyone has a place and everyone can be helped and healed by God. I just want to thank Nancy for listening to God and believing in Him enough to go out on a limb and start Mercy. She has helped so many women, including my mom and me. If you or someone you know is facing an unplanned pregnancy, learn more about how Mercy Multiplied helps women choose life.